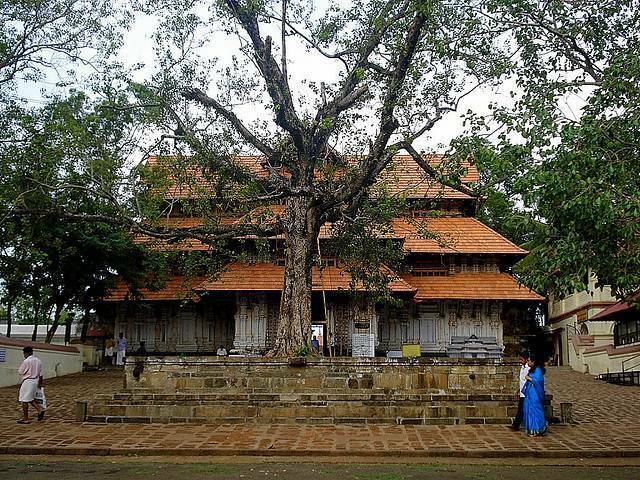 Located on the heart of the Thrissur city, Vadakkumnathan Temple is often termed as the Kailasam or Vrishabachalam. The temple is a magnificent example for Kerala Style of architecture. The Temple is well surrounded by a huge masonry wall with four gigantic gateways (Gopurams). The craftsmanship of wooden paneled Koothambalam (Sanctum Sanctorum) is exquisite piece of work. The main deity is the Lord Shiva. There are also small shrines for Goddess Parvati, Sri Ganapathy, Srisankaranarayana, Sri Rama and Sri Krishna. Temple is renowned for its amazing mural paintings. This temple which covers nearly 9 acres is the site where “Pooram” festival is celebrated every year in April or May. As per Hindu Mythology, the temple was built by Lord Parasurama.